When Errol Flynn and his teenage consort first arrive in Vancouver, B.C., it is with a limited agenda. The fading Screen Legend plans to sell his yacht Zaca to a selected buyer. Fast in, fast out. That’s the plan. But complications soon occur, and the actor is embroiled in an escalating conflict that predates his arrival in the Canadian city. Adam Cole, an American now working as a trouble-shooting columnist with the Vancouver News-Herald, is committed to throwing light on corruption in the local police department. Suddenly Errol Flynn himself becomes a target for extortion. When Adam Cole exposes the scheme in his column, the actor befriends him on the spot, even assigning his own bodyguard to protect him against reprisals. In a spiraling sequence of events, threats turn into sinister incidents – and potentially lethal confrontations. But for those in the front lines, there can be no turning back. 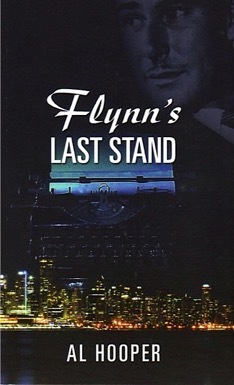 Flynn’s Last Stand is more than a just a fast-paced thriller set within a framework of five frenetic days in the life of Errol Flynn. At heart it’s a love story. It’s about people and relationships, and about friendships that can even survive betrayal. The novel takes the reader inside a period in journalism when the credo was clear and unwavering: Learn the truth, print the truth, and be willing to pay the price. As Adam Cole will tell you, there is always a price to pay.